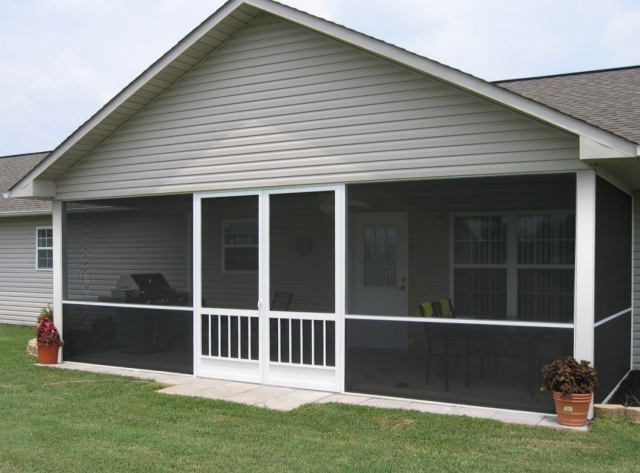 Why consider a fall screen door replacement or screened room enclosure? Almost everyone I know is wishing there was some way to make summer last longer. For that reason alone, many homeowners are looking at their fall to-do list to get ready for winter. Then there are those are looking for a fall project that can make those lingering summer days stick around for a little longer. What if you could have the best of both worlds? Lighten the chores list AND extend the summer- like days into fall. A screened room or enclosure isn't just about the luxury of lengthening the summer days. For those living in the southern regions where lyme-disease carrying ticks or West-Nile virus carrying mosquitos can endanger a young family or cause anxiety in a senior community. With a bug-free screened room enclosure and screen door, the additional protection is just another reason to be able to relax and enjoy the waning warm days of autumn. In the northern areas, stretching the days of summer into fall as well as protection from disease carrying insects might seem like a futile effort. It is a common perspection that with rough winds and weather, even the most durable screen enclosure systems or screen doors would not be able to last long. What many do no realize is that for these areas, its not just about the screen, but the screen frame system that matters the most to be able withstand wind, temperatures, even pets and children! The frame of your screen room should be as strong as the frame of your screen door on it. Who says you can't have style with functionality and durabilty in your screened room enclosure and screen door? 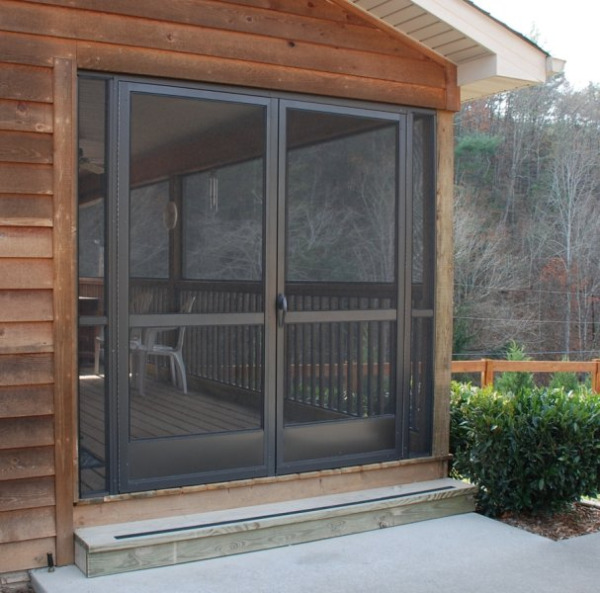 With a custom aluminum screen door, you can the match color and style of your screened room enclosure and home. With more home associations banning traditional storm doors because they lack style and actually can rot wooden frame doors, more homeowners are looking to custom aluminum screen doors for style as well as function. 1- Having a french screen door on a screened enclosure makes the seasonal transition easier with the additional space. Now instead of trying to navigate that wicker furniture through the door, you can easily move it in and out of the room if need be. No sweating and cursing when it gets stuck, or damaged. 2-Even a screened enclosure with a single single screen door eliminates everyone's favorite fall time chore- leaf and debris clean up of the deck. Instead of sweeping the deck or patio every day, you can sit, relax and watch as the beautiful colors float past your deck or patio. 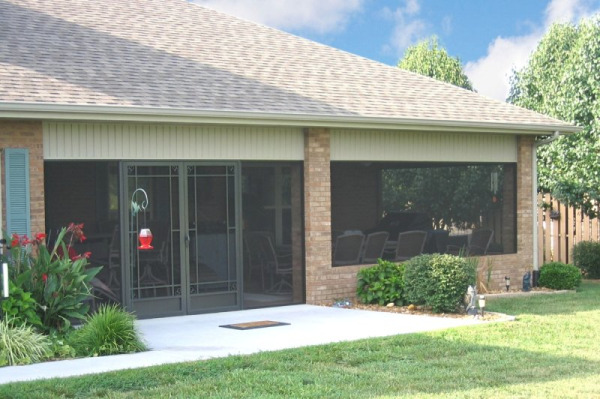 Does your contractor or supplier for your screened room enclosure offer a high quality and stylish screen door as well? Shouldn't they? Why do you have to go to a seperate supplier or the nearest store that might sell something close to what matches the screen room- for a screen door? You don't. Tell us who they are, maybe we can help you get the best of both worlds. Are you a contractor, supplier, or lumberyard that is selling a lot of rakes lately to people who would rather not have to buy them? What if you could make their last summer days enjoyable? You can.